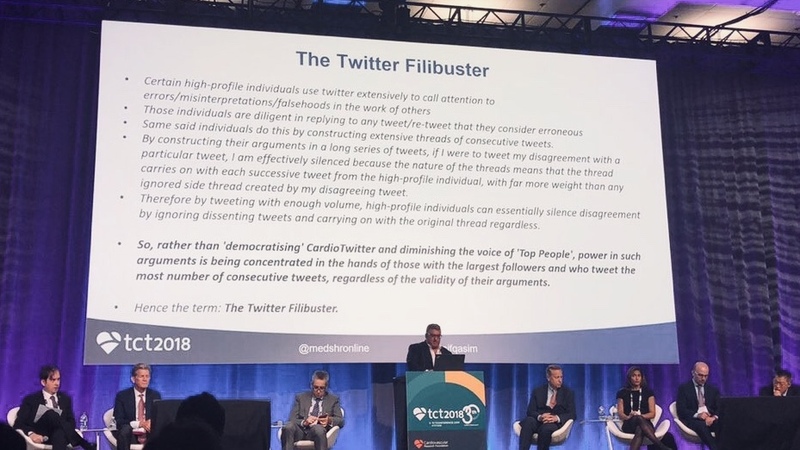 The Twitter Filibuster as detailed below was suggested by Dr. Asif Qasim during a presentation at the 2018 Transcatheter Cardiovascular Therapeutics (TCT) conference, one of the world’s largest meetings specializing in interventional cardiovascular medicine. The slide as represented here drew significant dialog and discussion around the emerging role of social platforms in the discussion of medical research. To put Dr. Qasim’s comments in proper context, he reports that his slide represented the sentiments of one of his junior physicians. Certain high profile individuals use Twitter extensively to draw attention to errors/misinterpretations/falsehoods in the works of others. Those individuals are diligent in replying to any tweet/re-tweet that they consider erroneous. Same said individuals do this by constructing extensive threads of consecutive tweets. By constructing their arguments in a long series of Tweets, if I were to retweet my disagreement with a particular Tweet, I am effectively silenced because the nature of the threads means that the thread carries on with each successive tweet from the high profile individual, with far more weight than any ignored side thread created by my disagreeing tweet. Therefore, by tweeting with enough volume, high profile individuals can essentially silence disagreement by ignoring dissenting tweets and carrying on with the original thread regardless. Public conversation is a reality and it isn’t going anywhere. And we are all adjusting to discussion outside of traditional channels such as journals and meeting podiums. To Dr. Quasim’s point, the opinions of those with larger followings acheive greater visibility due to the nature of Twitter and the compounding effects of social sharing. Historically there have been those with preferred access to traditional channels of medical dialog (editorial pages of high impact journals). The unaffiliated working doctor has little chance of having her voice properly represented. The inability to be heard in this case is a failure of the proper affiliation and connection rather than the ability to mount a solid argument or raise a new idea. New social media levels the playing field for so many brilliant, unrepresented minds deserving to be heard. Public networks of all varieties move medical correspondence from permission-based to democratized. Traditional affiliation-based authority is being challenged by a type of open-access thinking. The tension is natural consequence of change. The Twitter filibuster reflects an emerging tension between establishment physicians new to Twitter and those already entrenched in public space. I suspect that the disparity between the two is likely to become greater with time. Consequently, we risk a new model of influence by follower count rather than originality of ideas. And to facilitate unbalanced influence in the hands of a limited few is to recreate the old paradigm. Despite medicine’s history of supporting the voices of those most integrated within the vertical hierarchy of institutional medicine, leaders in this new medium should make every effort to facilitate all ideas independent of following, influence or opinion. Balanced conversation on platforms such as Twitter will ensure the future of public platforms as a space for fair, even-handed dialog. The Twitter Filibuster was published here with permission from Dr. Qasim. Image by Dr. Mamas Mamas used with permission.